We are reaching the end of my series on the Central California coastline from Big Sur to Bodega Bay. I've been calling the series "Where the Sierra Nevada Rises From the Sea" for a very specific reason. 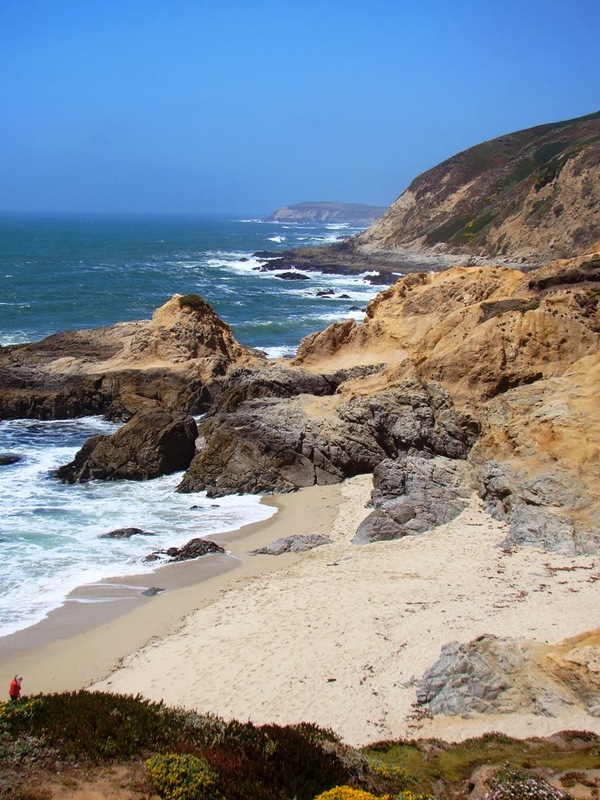 Much of this section of the coast is composed of granitic rocks that formed in the subduction zone complex that was the origin of the Sierra Nevada batholith, the 400 mile long block of granite that is the backbone of California. 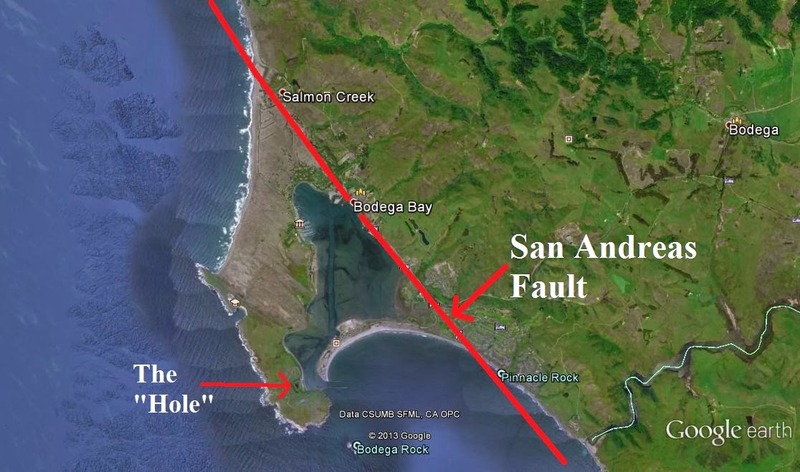 The rocks, known as the Salinian Block (or Terrane), have been displaced hundreds of miles northwest by lateral motions along the San Andreas and related fault systems over the last 30 million years or so. Bodega Head is the northernmost exposure of these granitic rocks. Bodega Head refers to the former island of granitic rock that is now connected to the mainland by a large area of active and stabilized sand dunes. 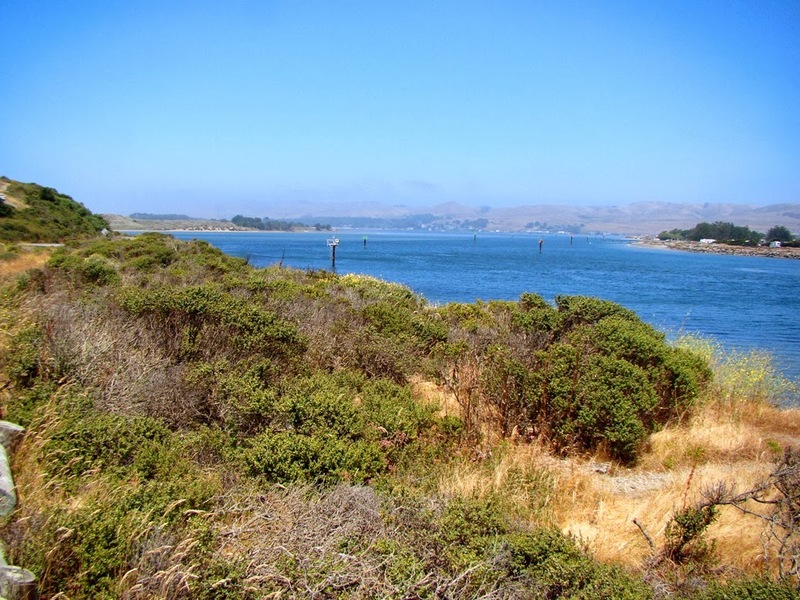 Bodega Bay formed between the head and the mainland, and is nearly closed off on the south side by a sand spit along Doran Beach. A small marina is here and a modest fishing fleet works out of the harbor. 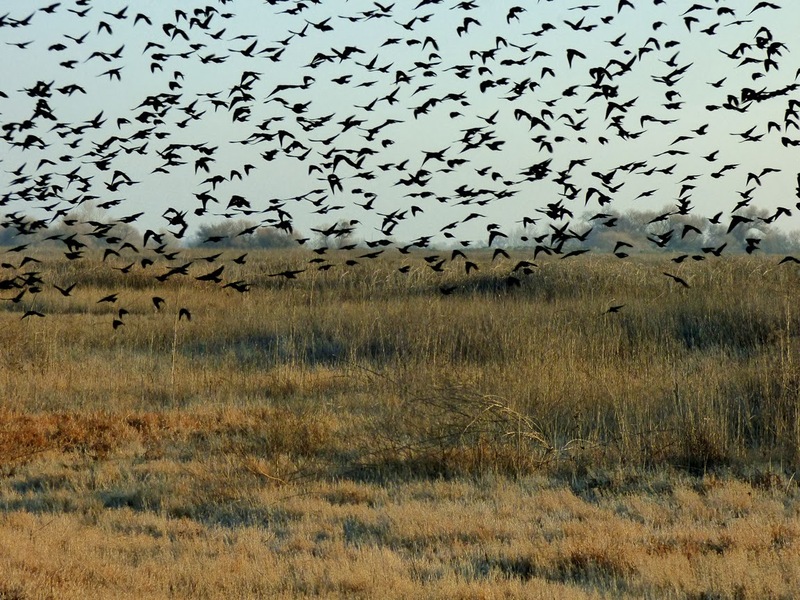 No, this isn't a bird attack at Bodega, but I sure thought about it while I was snapping this shot of Red-wing Blackbirds at San Luis National Wildlife Refuge near Los Banos in the Central Valley. One may not know Bodega for the geology, but there are those who will remember Bodega Bay as the setting for a rather famous movie about our avian friends, The Birds, Alfred Hitchcock's classic. 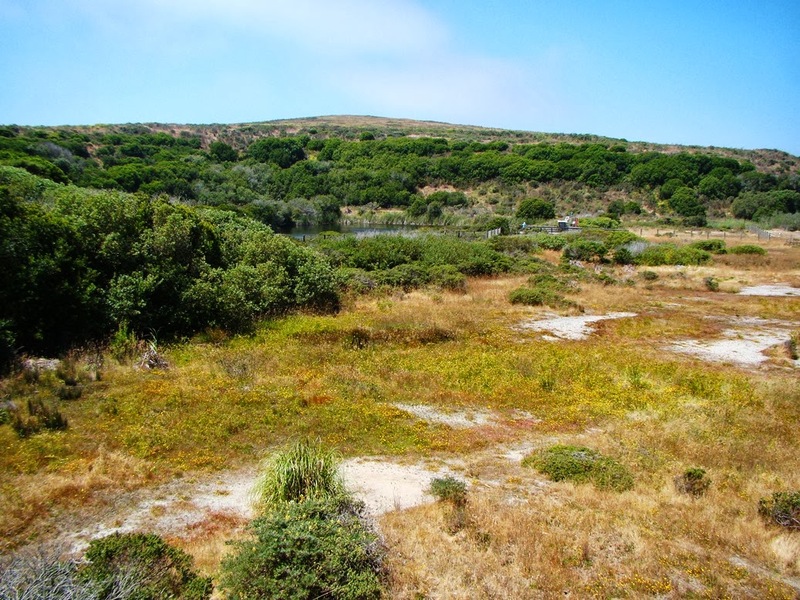 The original house where many scenes were shot is gone now, but the cypress grove where the house stood can be seen on the sand bar that connects the Head to the mainland. 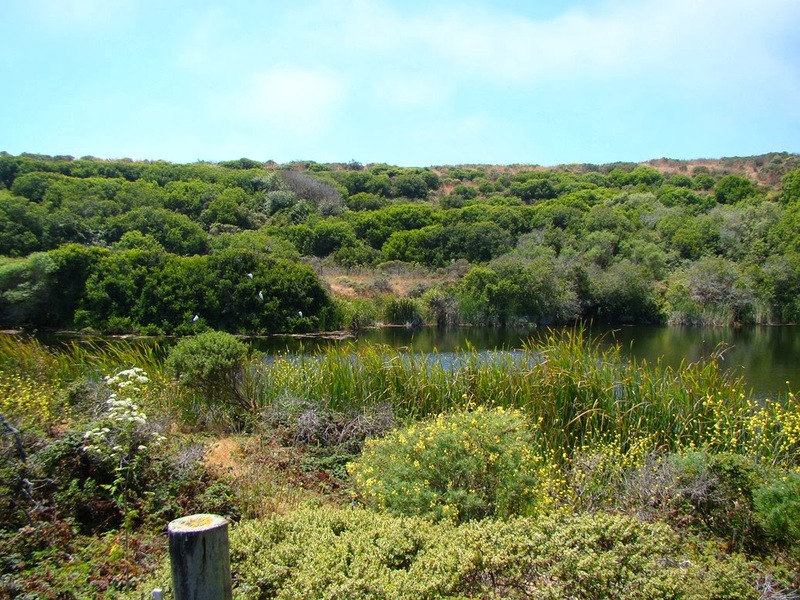 The land is owned today by the University of California, which runs a research facility at the site (occasional tours are offered). Bodega Head has a horror story that may be the equal of an unexplained attack by our feathered companions. The rock sequence found east of the San Andreas fault is part of the Franciscan Complex, and these rocks are notorious for their slope-failure tendencies. Mass wasting is a way of life for anyone who chooses to build on it. Bodega Head on the other hand is composed of hard granitic rock. No slope failures would be expected there. So it was that in the 1950s that PG&E looked with great longing at the granite headland and decided that Bodega Head would be an ideal spot for a brand new nuclear power plant. The water they needed was there, there was solid ground to build on in contrast with the lousy slopes east of the fault in the Franciscan Complex. And not that they thought of things this way back then, but the site was fairly isolated from large population centers in case of bad accidents (which we all know NEVER happen with nuclear power plants). And adjacent to the San Andreas fault! Its not like they didn't know it was there. In 1906, this part of the San Andreas shifted 15 feet or more. So they began digging a hole that would serve as the foundation for the power plant. As the plans and excavations progressed, local opposition began to grow, and ultimately the company somehow realized they were about to put a nuclear reactor practically on top of the San Andreas fault (subsidiary faults were discovered in the excavation pit; a geologist opined that “a worse foundation condition would be tough to envision.”). 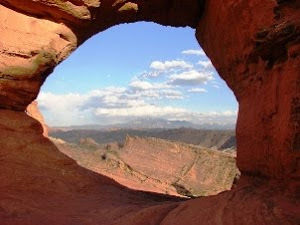 The pit became known as the "Hole in the Head". 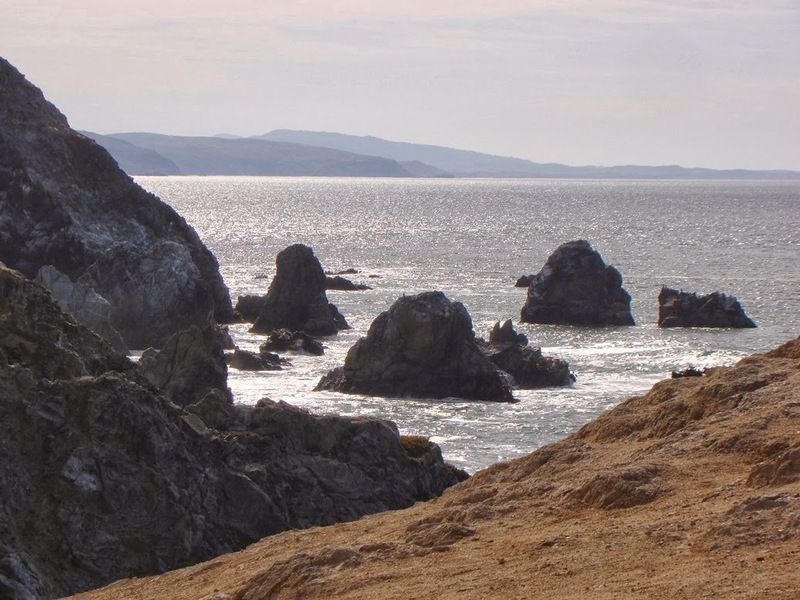 So the nuclear power plant was never built, and Bodega Head remains as barren windswept ridge with beautiful cliffs composed of the northernmost exposures of the granitic rock of the Sierra Nevada. The Hole in the Head filled with seeping groundwater that now supports the local wildlife. And so ends our little series of a part of the Sierra Nevada mountains that rise from the sea. I hope those of you who've followed it enjoyed the journey. I'll be putting up a compilation of the different posts in the series since it has been a rather off and on project over the last three months! I've enjoyed your posts - & fabulous photos - so much, Garry. Thank you for sharing your passions with everyone here. I'll be looking forward to another focus of yours in genealogy and related items. Thanks for these posts. 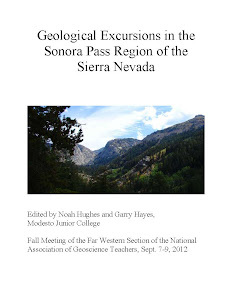 Having just renewed my childhood interest in geology, I've really enjoyed reading them, which, in a credit to your writing and ability to explain, I've been (mostly)able to understand. Fun and informative! Thank you! Thanks for sharing such revealing and magnificent photos. I learned a lot while reading your blog. I'm pretty sure to be looking forward for the next interesting topics soon.